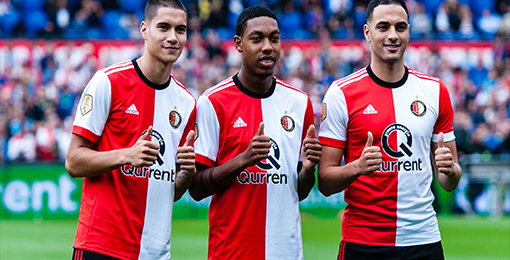 If you want to buy cheap Feyenoord shirt for 2018-19 season, buy it here in cheap-football.com , Check our exclusive range of Feyenoord Football Shirts / Soccer Jerseys and Kits for adults and children at amazing prices. Get the cheap Feyenoord jersey shirts, soccer kits with wholesale price, Free Shipping Worldwide! Feyenoord is a football club in the city of Rotterdam, in the Netherlands. It was founded in 19081. It is the most popular club in the Netherlands and third in terms of titles obtained after Ajax Amsterdam and PSV Eindhoven, as well as being the first Dutch club to win the Intercontinental Cup, the European Cup and the UEFA Cup. It is one of the four Dutch teams that never descended, although the only if regional tournaments are taken into account since 1898.In his record, the Feyenoord has 15 Eredivisie titles, twelve Dutch Cups, two Dutch Super Cups, one European Cup and two UEFA Cups.3 He is also one of only two teams Dutch to enshrine world champions. The highest point of its history came at the beginning of the 1970s, when it was consecrated champion of the European Cup and the Intercontinental Cup. Despite not having a good time, Feyenoord was the last Dutch team to win an official European tournament, as they became the 2001-02 UEFA Cup winners in their stadium. His last league was obtained in 2017.